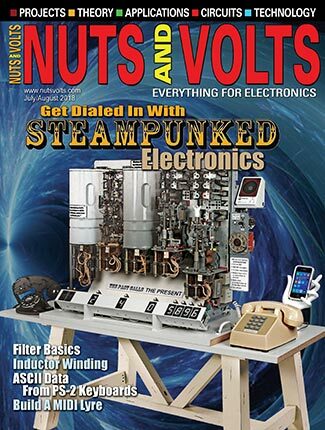 Back in the January 2015 issue of Nuts & Volts, I summarized all the popular low speed serial interfaces like RS-232, I2C, CAN, and others. In this article, I will familiarize you with the high speed gigabit serial interfaces that dominate I/O today. When you think about it, what electronic product does not have a serial interface? I can’t think of one. We all use at least one of these interfaces regularly. 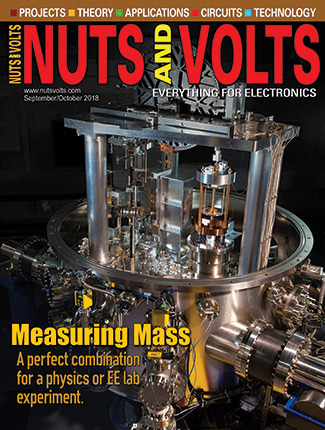 Parallel data transfers are generally faster than serial, but are more expensive as they require more hardware, larger connectors, and one wire per bit. Furthermore, as parallel wires get longer, the inter-wire capacitance and the inductance of the wires and crosstalk greatly impact the data rate, so shorter connections are necessary to get any speed. Data skew on the lines is also a problem. Parallel connections are not very useful at rates beyond about 100 Mb/s, and that can be achieved only over a foot or so. Serial transfers are less expensive, simpler, and can achieve high speeds over longer distances. Today, serial interfaces dominate. There are literally dozens of gigabit serial interfaces in use, but I will only summarize the most popular ones here like USB, HDMI, PCIe, LVDS, Ethernet, and OTN. By far, the most widely used gigabit serial other than Ethernet is the Universal Serial Bus (USB). It is used on all PC peripherals like keyboards, mice, printers, disk drives, Flash memory sticks, and others. This interface has been around for quite a while, and has been upgraded steadily over the years to improve its data rate. The original version was slow at 12 Mb/s, but it was faster than the RS-232 and parallel printer ports it replaced. Version 2.0 boosted data rates to 480 Mb/s which is fast enough for most peripherals. The basic USB configuration is shown in Figure 1. FIGURE 1. Topology of a USB connection. The host is usually a PC or laptop. The hub serves as an expander. 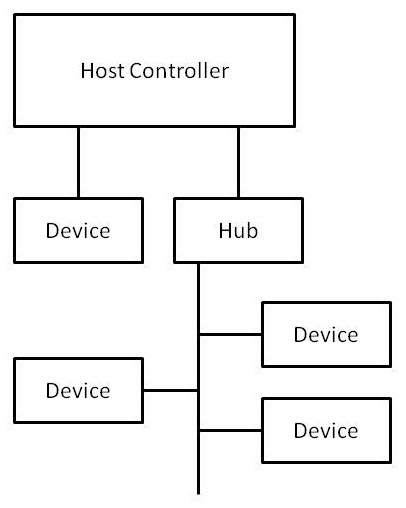 The host — usually a PC or laptop — controls all operations and allows multiple slave nodes to connect. The network topology is a star, with one port per slave. If you need more than the one or two ports normally supplied on a PC or laptop, you can add a hub. A hub connects to one of the star nodes and offers multiple bus connections. Most systems can support up to 127 nodes. Communications are half duplex which means two-way, but only one direction at a time. Data is sent in packets with up to 1,024 bytes per packet. The interface is really simple with just four wires and connector pins. It only uses a single twisted pair for data. The signals are differential which helps with noise mitigation. The only other connections are +5V and ground that are used to power external peripherals if needed. The maximum cable length is five meters for versions 1.1 and 2.0 to get the higher data rate. Repeaters and extenders are available to lengthen this if needed. More recent versions 3.0 and 3.1 use a larger, more complex 10-pin connector with three differential data pairs. This permits full duplex operation or simultaneous send-receive. Data rates are bumped to 5 Gb/s and 10 Gb/s. This restricts cable length to three meters. This faster version finds applications in video equipment. Another widely used gigabit interface is the High-Definition Multimedia Interface (HDMI). It was designed for and is used primarily for video data transfer. It is found in HDTV sets, DVRs, Blu-Ray players, set top boxes, video games, camcorders, digital video projectors, and even some PCs and laptops. HDMI is designed to carry uncompressed video and either compressed or uncompressed audio. The general configuration is shown in Figure 2. With today’s high pixel count, long color words, and fast refresh rates, speeds must be fast to keep up with the video action. 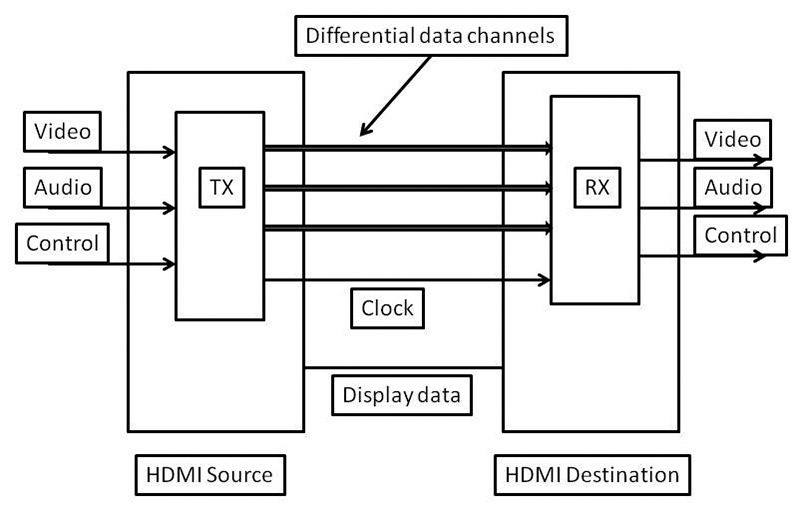 The first versions of HDMI could handle 1.65 Gb/s. Later versions bumped this up to 3.4 Gb/s. The latest version 2.0 delivers 6 Gb/s — enough to support the latest 4K ultra HD video. FIGURE 2. The HDMI source may be a cable or satellite TV set top box, while the destination is an HDTV set. As for cables and connectors, cable length is restricted to five meters to achieve those elevated data rates. With special cable, lengths of up to 15 meters are possible. You can also buy repeaters and extenders to string that out for as many meters as needed. Connectors are another matter. The standard has 19 pins. A larger extended version has 29 pins. Mini and micro 19-pin connectors are also available for some devices. There are three differential data channels for video data and control information. These channels use what is called time minimized differential signaling (TMDS) to time-multiplex the video, audio, and control information. The interface even incorporates a standard I2C interface to handle data for the type of display. The interface also includes the high bandwidth digital content protection encryption software to prevent the recording of proprietary video. PCI Express is the serial data interface that replaced the PCI and PCI-X parallel interfaces in PCs and laptops. It is the interface on the motherboards and backplanes in computers that interconnect the processors, co-processors, memory, and peripheral chips. 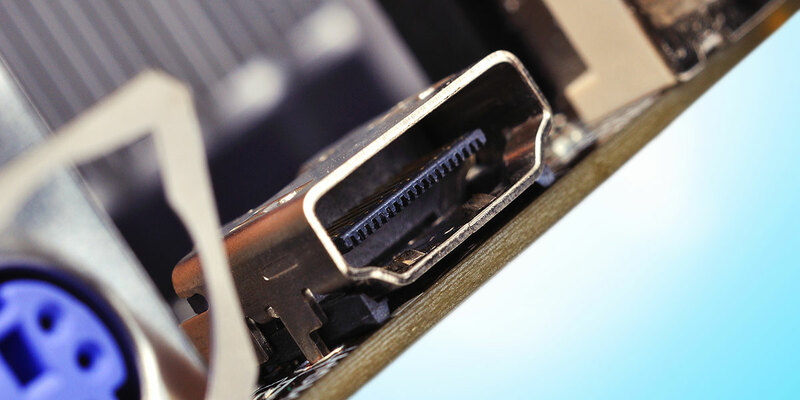 The interface is also implemented on connectors for attachment to expansion cards. What PCIe does is replace those 32-bit parallel busses with one or more serial data channels. Each channel is a pair of differential lines, so that full duplex/simultaneous transmit and receive operations are possible. Each of these channels can transmit at gigabit speeds depending on the version. Version 1 channels run at 2.5 Gb/s, version 2 at 5 Gb/s, version 3 at 8 Gb/s, and version 4 at 16 Gb/s. If you need a greater data rate, you just use four, eight, or 16 of these channels in parallel. Data bytes are interleaved between channels. For example, with four channels (x4) at 5 Gb/s, you get a total transfer rate of 20 Gb/s. That translates to two gigabytes per second, or 2 GB/s since 8B/10B encoding is used. The maximum rate with sixteen 16 Gb/s channels is 256 Gb/s. At these speeds, range is short; typically inches on a PC bus that runs on a motherboard. Short cables are available for testing. Data is transferred in packets using a standard protocol which includes a 32-bit CRC for error detection and correction. Most connections are just point-to-point, but some applications use a fast PCIe switch IC that lets one CPU serve multiple peripherals. 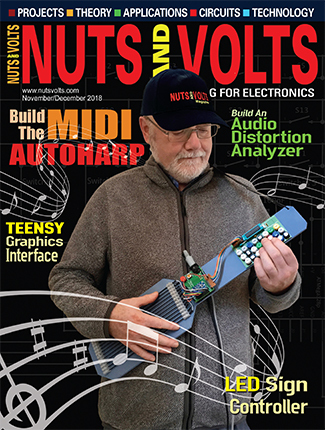 One of the interfaces you will hear about is Low Voltage Differential Signaling, or LVDS. This is just the physical layer (connectors, cable medium, logic levels, etc.) of an interface. It does not define a protocol for data transfer. It is the physical layer of many other interfaces such as PCIe (just described). An LVDS interface uses differential pairs for point-to-point connections. 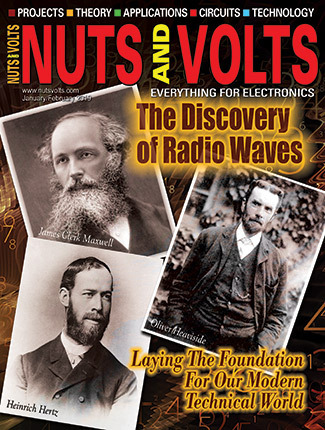 The pairs have a transmission line impedance of 100 ohms. Differential logic levels are typically ± 350 mV. The M-LVDS version of the standard also supports a multidrop bus connection format with up to 32 drops. Typical data rates are in the 1 Gb/s to 3 Gb/s range. The length of connections is typically inches on a PCB (printed circuit board). A special M-LVDS version uses ± 480 mV levels, and can be used at distances up to 10 meters or more at lower data rates. What can I say about Ethernet? It is just everywhere. It is the overall networking technology of choice. It was originally developed as a local area network (LAN), but is now used in larger and longer range metropolitan area networks (MAN) and even wide area networks (WAN) for Internet connectivity. Other versions are used on backplanes in servers and other communications gear. The original versions were not gigabit interfaces. The main standard IEEE 802.3 started at 10 Mb/s, but soon jumped to 100 Mb/s. The 10/100 versions were widely implemented and many such LANs are still around. Soon, new standards emerged for 1 Gb/s and 10 Gb/s. Today, we have 40 Gb/s and 100 Gb/s versions. Ethernet started out with several versions that use coax cable. Those were soon replaced with cheaper and more flexible unshielded twisted pair (UTP) cables such as the popular CAT5/5e/6/7 varieties. Several fiber optic cable versions are also defined and widely used — especially with the higher data rates. Table 1 gives you a glimpse of the Gigabit Ethernet (GE) 40 and 100 Gb/s versions. TABLE 1. 40G and 100G versions of 802.3ba showing medium and range. To get 100 Gb/s, you can use special optical modulation techniques on SMF or MMF to reach ranges of 100 meters to 40 km. In some formats, 100 Gb/s is obtained with 10 parallel 10 Gb/s cables or four 25 Gb/s cables. Some versions multiplex four or 10 data streams on different wavelengths of infrared light on a single cable. Today, most PCs, laptops, and other common devices have a 1 Gb/s port. The higher data rate versions are used in servers, routers, switches, and other data center gear. The network topology is a physical star, but a logical bus. Hubs and switches connect multiple nodes to the network and related servers. Ethernet continues its expansion. A 25 Gb/s version to connect Wi-Fi access points in hot spots is under development. Also being created is a set of standards for 400 Gb/s. Yes, 400 Gb/s that will be used mostly over shorter distances in data centers to connect servers, routers, and switches. A one terabit/1 Tb/s version is undoubtedly in the future. Have you heard of this? Optical Transport Network is the long haul fiber optic technology used in upgrading the Internet backbone. It is replacing proprietary links, as well as the entrenched Synchronous Optical Network (SONET) that has been around for decades. SONET ran out of speed with its peak 40 Gb/s version. It was used in mostly rings, as well as direct point-to-point links. OTN provides higher speeds and other advantages. OTN defines four basic data rates: OTU1 at 2.66 Gb/s; OTU2 at 10.7 or 11.09 Gb/s; OTU3 at 43.01 Gb/s; and OUT4 at 112 Gb/s. These rates allow OTN to carry other network technologies. SONET is a synchronous network that runs in step with a clock, and all operations are timed. Everything must be in sync with the clock. OTN is an asynchronous technology, and data is carried in large packets or frames. The data inside can be other network protocols like SONET or Ethernet. That is why OTN is called the digital “wrapper” since it can transport almost any other data format at Internet speeds.